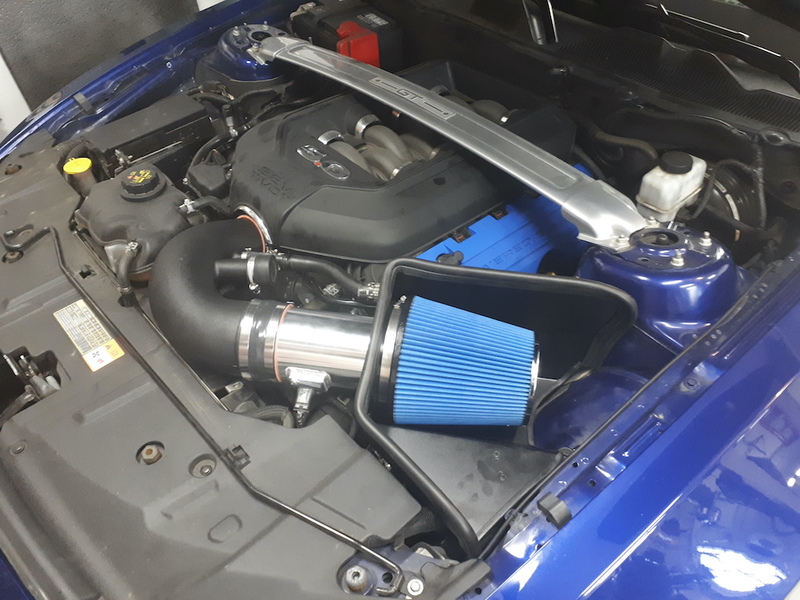 Steeda's ProFlow Cold Air Intake on an otherwise stock 2011 and up 5.0L Mustang has achieved a blistering 1/4 mile time of 11.96 at over 115mph! Steeda was the first manufacturer to get into the 11.90 range on a radial tire. Competitors had to use slicks to keep up. Steeda Autosports, the world's largest aftermarket manufacturer of Ford performance equipment is once again leading the performance market with our High Velocity Cold Air Intake (CAI) and SCT custom tuning device package. This intake/tuning package called our Ultimate Induction Pak combines our High Velocity Cold Air Intake with an SCT X4 tuning device for the ultimate easy to install power upgrade. The high velocity CAI in this package effectively opens up the intake system of Ford's new five-liter power plant and allows it to breath much more freely than the stock intake system allows - taking your 2011 and up 5.0L Mustang to the next level of performance. To ensure the densest air charge possible we retained the factory cold air feed ducting from the front bumper and sealed the stainless steel shield to the hood to prevent any hot air from being sucked in from around the engine compartment. Other manufacturers have chosen to ignore the factory cold air ducting which is key to keeping the lowest air charge temperatures possible. Steeda was the first company to do this starting in 2010 with our 2010 GT intake and have carried this innovation over to the 2011 model. Also, a billet aluminum velocity stack and high flow air filter ensure a clean, cool, streamlined air charge straight to the engine. The new high flow "ProFlow" intake tube provides the necessary ports to retain the factory noise tube and PCV tubes. This Cold Air Intake is so effective at improving airflow into the five-liter engine that a performance tune is not just recommended, it is required for maximum performance! Combined with the required custom tune using the industry leading SCT X4 Flash Programming Device we have achieved dramatic power increases of up to 44hp and 52ft/lbs of torque! SCT Tuning is the leader in the Ford tuning industry and Steeda's partner in developing this powerful package. Our power increase it not just a peak number at one point in the band. The actual power increase is spread throughout the entire rpm range so your increased performance is available on demand in any gear at virtually any rpm! I finally decided to upgrade my FRPP ProCal tune, AirRaid intake tube, AFE filter and try out the Steeda CAI/Tune. What a difference between the two setups. The Steeda intake is a real quality piece and looks great. The combo really woke the car up. There isn't any flat spots in the power band anymore that I experience with the stock tune. I haven't been to the track yet, but it pulls much harder and spins the rubber much easier. (When I remember to turn off traction control :) The intake air temps have been much lower sitting in traffic than with my first CAI which was the Roush no tune. Very fast service getting the parts and getting the tune emailed to download to the sct x4. Installed the intake in about 30 minutes with hand tools. The fit and finish is great. After install I noticed a lot more power with no more flat spot in the power band. Since installing the kit I have ran against a challenger 6.4 and walked out his life and ran a 2018 mustang 5.0 and put a car length on him. Needless to say I'm very impressed. Plus the gas mileage has only went down 0.5 mpg. Tested before Intake 370 whp and after the intake and the custom tunning 391whp with 91 Octanes. A huge 21whp!!! throttle response is awesome!!! Highly recommended product! Well, I installed the Steeda intake and 91 octane tune, and whoa buddy. Car is a beast now, and the sucking noise made by the intake is intoxicating. Easy on the eyes too. Good stuff, HUGE thanks to you and all the folks at Steeda. You guys rock. Night & day difference! I had this package installed on my 2012 GT with cat-deletes and I couldn't be happier with the results. I upgraded from the Ford Pro-Cal tune and the difference is immediately noticeable. It eliminated the Ford Pro-Cal 'ping' issue that seems to plague everyone. From a stock tune it's a whole new world. Get this, you will not be disappointed. The gain in MPG is a nice bonus too! Alright, so where do I start. And yes, another tune review After researching for a long time about which tune I should get, I decided to pull the trigger on the Steeda tune and CAI. I researched and researched about Steeda, finding many positive reviews which convinced me to pull the trigger on it. Now I know some of you might be saying why not AED and all that stuff. AED just didn't seem necessary for my car with just axlebacks and CAI now. I'll do a review now for each item that I got in the package, which are the cai and tune. Steeda CAI: This CAI really put a smile on my face the first time I heard it. The sound it gives you is just amazing and IMO is totally worth it. VERY nice piece of hardware and a great mod to get for your mustang. Steeda 93 tune: All I can say is wow! I mean, the second I drove the car I felt a very noticeable difference. The car just doesn't stop pulling and is ready to go when you want it to. Also, the car runs just like it did stock. Very smooth idle, no pinging, or surging. Nothing. It's almost like a whole new car, and I am not kidding. As much as I loved the car stock, I love it even more now with the tune and CAI. Also, I'm pretty sure my MPG went up also. Not too sure yet, I'll have to check soon. So overall, is the Steeda tune and CAI worth it? YES. If any of you guys are on the fence about getting this package, do not hesitate. The guys at Steeda are fantastic and trust me, you will not be let down by this tune and CAI AT ALL. If you guys have any questions about my experience with the tune, please feel free to ask down below. Have a good one! I was not disappointed after installing this kit on my 2011 GT/CS. Noticeable power gains and the tune is much better than stock. Great upgrade for the price. I have a 2014 GT Track Pack car I have had the car almost two years. It has 3900 miles on it I thought the car ran very well stock. But I wanted just a little bit more so I called STEEDA and purchased there tuner and cai . Its been on the car for over a month and I just got around to driving the car. WOW the 93 tune is killer what a blast too drive. Buy there kit its badass! I got this with a 91 Octane tune and it is a complete night and day difference. Power is much more instant and linear. The intake itself installed perfectly. This is a top notch product and made in the USA. Also my MPG is up as well. This + Cat Delete = 60 RWHP! Get this and only this CAI package for your Mustang with the Steeda tune. I had Ford Racing axle back exhaust on my 2014 GT and added this power package with the new SCT tuner and Steeda tunes for 91 & 93 octane and this power package completely transformed the performance of my GT. Most other sites will also recommend the Steeda CAI as the best on the market. I have recently added the Steeda Cat Deletes and a new tune from Steeda (free) that includes the CAI and Cat Delete for my GT and now I am driving a beast. Completely different car. These two upgrade get you almost 60 RWHP for around $840, best deal going for that much horsepower. Also the Steeda guys are great and know their stuff. So glad we made this purchase. After reading the reviews it seemed like a no brainer. Shipping was fast and the items were very straightforward to install. Instantly felt the gains in the GT! Product is better than advertised. The fir and finish of the CAI was spot on and made a world of difference. This is the best combo you can buy. The cherry on top of the package was the customer support by Steeda. I would like to tip my hat to Frank at the Valdosta GA location. He responded to all my email questions promptly and when I went to pick up my parts (which he thought he was shipping) was kind enough to pull my order check everything out and flash the tune while I was there. When he was done with that he took the time to walk me around the entire warehouse and gave me a chance to check out the 3 cars they had there, the design and testing section, storage and shipping. Just goes to show what Steeda stand for. Good products and better customer service. Thanks Steeda, Richard C.
Wish I would have ordered this sooner. The customer service at Steeda is top notch and the gains were amazing! This is the best bang for your buck upgrade! Want to hit 11's? Do yourself a favor and order this kit, you will not regret it. Was looking for the safest product for my car as I do not have the money to spend on a new engine. Everything I read pointed towards this combo!! It arrived shortly after the order was placed. Customer service was great as I called them a couple times with question about the tune. I got everything put together and the tune loaded on the car in about 1 hour. The power boost is very noticeable and worth the money!! Overall great product as far as fit and finish. This thing pulls in so much air. Have had the 93 tune and CAI on the car about 4 months with no issues at all!! I've had my 2014 Mustang GT w/Track Pack for about 3 weeks now. The power, compared to my old 03 GT was like night and day. I ordered this CAI and tune from Steeda on the recommendation of my cousin. He had an 09 GT500 with Steeda CAI and tune and said it was awesome. I ordered the kit on Weds morning at like 2am, I rarely sleep. Got a call from Frank later that morning, to get some info from me, and told me about this package, as I had ordered the CAI and added the tuner. This saved me about $70, which was awesome. The kit shipped out that day, and I received it on Friday. I installed immediately. Took me about an hour. On the test drive afterwards, I noticed the power increase and how much harder it pulls above 3000rpm. Before this my car was quick, now it is almost scary, almost. lol I love the sound of the intake, along with my GT500 mufflers, I installed and the deleted resonators. My car now sounds like a Mustang and runs like one too. Just wanted to Thank the Steeda guys for a great Package. I think the only complaints will be coming from my rear tires. Just recently installed the CAI power pack on my 2012 GT 6spd.Installation was easy and what a difference!Completely different driving experience,it really woke it up.It was fast before but now it's an absolute beast.This is probably the best power add you can do for the price.I've bought multiple items from Steeda before and anything you buy from them is second to none.Just a very happy customer! I'd been running a Ford racing reflash and air filter for about a year on my 12 GT. It was OK but not much of a difference over stock. Just went for a test ride after installing the Steeda cold air and reflash -What a difference!!!!!!!!!! I was hoping that I would be able to tell the difference and didn't just waste $700 plus bucks. I can honestly say that it way exceeded my expectations and is the best money I've spent on the car so far. If I would have known how good the Steeda power pack was I would have installed it the day after I bought the car. Anybody want to buy a Ford racing power pack -CHEAP!!!! Was a little reluctant to try this at first. Finally decided to bite the bullet and just do it. Now I know what I bought a Mustang GT for. Installed it on my 2012. Excellent throttle response. Pulls very good through out the entire RPM range. I am running the 93 octane tune. It is a very strong but at the same time very streetable tune. Fit and finish is typical Steeda "first class". Very helpful and knowledgeable sales people. Shipped FedEx so I got it on Saturday. Should be on everyone's first to do list with this car. Thanks Steeda! This product does exactly what it claims to do. Even running on 91 octane (I live in CA) the car made 400 rwhp on a clayton chasis dyno ( a dyno which runs loaded and tends to provide slightly lower results than a dynojet.) Something else that this product does, which I wasn't expecting, is it makes the car sound like a beast! Not just from the air sucking sound, but it also seems to give the car a lower, bassier tone. Throttle response is much more crisp due the changing of torque management in the tune, as well as increased ramp up rate for the drive by wire system. This mod is totally worth it, and you probably won't find more bang for the buck doing anything else. I installed the Steeda CAI and SCT Flash Tune over the weekend and the car is amazing. This is definitely a must have addition to the car. The one beef I have is on the instructions for the install. I have the following recommendations for improvements: 1. Start in the middle. So the first thing the instructions say is to remove the existing unit, however I would recommend starting with the assembly of the new CAI since that will take the longest time. It is also something that you can do without taking your car apart so it means less downtime for your car during the install. If I had to do it again, I would assemble the CAI the night before, then do the removal and install the following day. Overall it took 2-3 hours including the trip to Pep Boys. I would say this is normal for first timers. I could probably do it now in close to an hour now that I've learned from my experience. 2. Include more pages/actual photos of the step by steps instructions. The instructions on page one referred to the figures and photos on page two. I was constantly flipping back and forth to figure things out. Just create a PDF and include it on the CD. I had better luck looking online at what other people had posted. 3. Check your hoses before the install. There are two small hoses that come with the kit (for the automatic). Make sure one hose is longer than the other since you will need that going to the engine valve cover. My kit included two short hoses so I had to use my wife's car to run out to Pep Boys in the middle of the install and buy some additional hose ($5). 4. Wear gloves when attaching the rubber edges onto the aluminum intake part so you doing cut yourself. As originally posted below, I had the Ultimate Induction Pak installed and was impressed the minute I drove away from the Steeda campus in Florida. Gus was so kind to e-mail me an update to the Steeda tune, which I downloaded to the SCT Tuner and uploaded it to my car... Thanks to the detailed instructions it was a matter of minutes to have the new tune installed! After the first drive I was shocked what a difference there was... if the car was leathal before, now its a beast! Thanks Steeda... simply amazing!!! I had called Todd to setup an appointment to have the Steeda Power Pak installed on my new 2011 Mustang GT with automatic transmission. Matt did the install and what a great job he did. Gone is the flat spot in acceleration between twenty and thirty miles per hour and the increase in horsepower and torque is noticeable immediately. The car breathes better thanks to the Steeda CAI and with SCT flash tune the shifts are firmer. Everything was done with perfection. Steeda are the best.